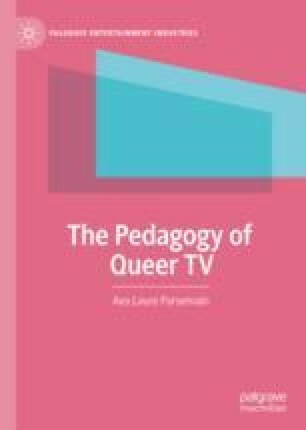 This chapter investigates the pedagogy of The Prancing Elites Project, a reality programme broadcast on Oxygen that follows the Prancing Elites, a team of five African-American dancers who identify as gay, transgender and gender non-conforming. It explores the series’ representation of queerness in relation to the black/African-American identity, showing how the Prancing Elites, like members of ballrooms, use artistic performance to queer gender, sexuality, race and kin relationships. This chapter also shows how the series employs entertainment techniques to educate about queerness, homophobia and transphobia in the black/African-American community. Although it uses the codes and conventions of factual television, the text primarily relies on dramatic music, slow and fast editing, melodrama and happy endings to teach about queerness.